Heading to the east of Hoi An, you cruise through paddy fields and follow the meandering riverbank for 5km. before reaching the glorious golden sandy beaches. 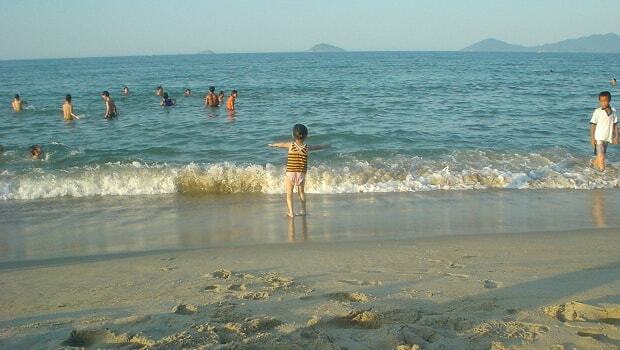 This is one of the most attractive beaches of Vietnam – Cua Dai Beach. 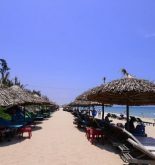 There are regular bikes (or motorbike taxi) riding from Hoi An to the clean, white sands of Cua Dai Beach. It is so comfortable when lying down on the deck chair, under the palm umbrella at one of the many beachfront café-restaurants. People often order at least a drink while watching spectacular sunsets over the Cham Islands just off the shore. From Cua Dai beach overlooking the sea is green Cham Islands – point ecotourism fascinating and majestic horns. Cua Dai highlighted by the magnificent bungalow, newly built resorts and modern facilities, surrounded by flowers and colorful radiate fragrance. The 3km stretch of fine white powdery sand and crystal blue water, exposed to sunshine and windy, offer visitors best time to relax and find their own patch of paradise. Besides swimming in the ocean currents, basking on the sand, watching the beautiful scenery, tourists can enjoy many dishes in here. Around the beach there are many restaurants serving fresh seafood dishes. In the evening, under the dim light, people sit on mats to enjoy cool breeze of the sea and drink beer with seafood to enjoy pleasant life. Guests also hire a small bamboo boat to go fishing and catch fish, squid under the guidance of fisherman from village nearby. Cua Dai is where the Thu Bon River empties into the sea so there is a lot of fish. Go fishing in the evening and have something back to make small party on the beach, will be an unforgettable evening for everyone. 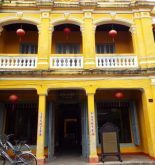 Cua Dai beach is developed to become a touristic place of Quang Nam, therefore, it is easy to find accommodation with spacious rooms designed in Japanese, classical French, ancient Vietnam style to maximize the comfort of visitors. 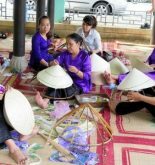 During the day, visitors can drop off many interesting attractions nearby such as Kim Bong Carpentry village, Tra Que vegetable village or Thanh Ha pottery village to find more about the traditional handicrafts of Vietnam, and get some lovely souvenirs for family and friends.